Please check our Lounge Rules below prior to booking. Admission is $8 per adult, and $5 for children at and under the age of 12. This allows for access into the lounge for one hour. We generally limit the number of people going into the lounge based on the number of cats currently in our care and how adjusted they are to the space. Please arrive ~5 minutes before your scheduled time to allow time for payment and to sign our waiver. You must be 19 years old to sign the waiver, so those under 19 will be required to have someone sign for them. Children 12 and under must be accompanied by an adult at all times, and we require 1 adult per 2 children. Please contact us if you will be running late. If you are more than 10 minutes late to your reserved spot without letting us know, we may give that time to someone who wishes to walk-in. ​For those under 19 who would like to have an adult sign beforehand, a printable version of our waiver can be found below. ​Please print this and have your guardian sign it. Click here for a downloadable version of our waiver. ​A cold bottled beverage or a hot tea or coffee can be purchased before entering. Please note that we are not a cafe, and our tea and coffee are self-serve from a Keurig machine. 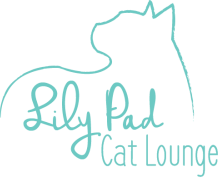 We will always have the lounge closed daily from 1pm-3pm to allow the cats to have a rest period. Please wash or sanitize your hands before and after going into the cat lounge. We kindly request no food or beverages be brought in from outside of the store. Please keep the flash off on your phone or camera. We definitely encourage people to take as much photos as they like (and please share them with us! ), but flash can be both irritating for cats and people alike. Please do not pick up cats until referring to the adoption board. Cats that enjoy or dislike being picked up will be specified. Children under the age of 12 are not permitted to pick up cats. Cats need a lot of beauty sleep (12-16 hours a day! ), so to keep their stress levels down, and to keep them well rested, we request that people do NOT wake up a sleeping kitty. Always watch a cats body language. We will have reminder images posted in the lounge to serve as a guideline of what to look out for. No running, especially not after cats. Children under the age of 12 must be supervised at all times by an adult. Max 2 children per adult. Additional rules may be added at any time.